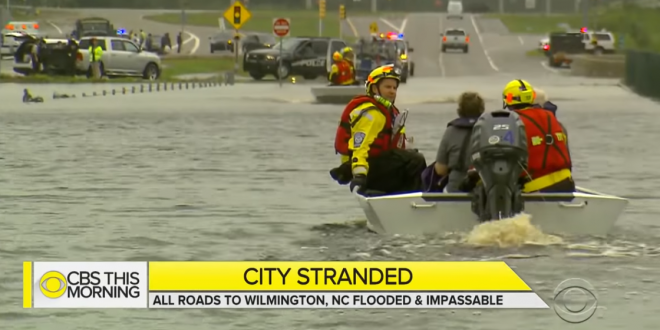 NORTH CAROLINA: Wilmington Cut Off By Flooding - Joe.My.God. Storm-weary residents of North Carolina struggled Monday to loosen the grip of Florence, the lingering killer that has closed more than 100 roads, cut off power to almost 500,000 homes and businesses and essentially cut off the city of Wilmington from the world. At least 17 people have died in the wreckage of the hurricane-turned-tropical depression that dumped 30 inches of rain in parts of the state since last week. In Wilmington, officials were planning to fly food and water into the coastal city of almost 120,000 people. Catastrophic flooding from Florence spread across the Carolinas on Sunday, with roads to Wilmington cut off by the epic deluge and muddy river water swamping entire neighborhoods miles inland. “The risk to life is rising with the angry waters,” Gov. Roy Cooper declared as the storm’s death toll climbed to 17.